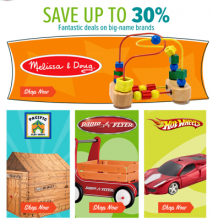 Head over to YoYo.com and check out their sale on Melissa & Doug, Radio Flyer, Hot Wheels and more. They have a huge selection of toys up to 30% off. Shipping is FREE on orders of $49 or more. Plus, if you are new to YoYo.com, you’ll get $10% off your first purchase of $20 or more with code: YOYO10 at checkout. Daily deals Dec 14, 2011 in holiday, kids, toys, YoYo · Expired!